For people looking for more of challenge, I found it a bit harder to play as a ghost - since their feet don't touch the ground, it's harder to tell where you standing when you need to jump. Monster Discussion / Re: Fashion Blind Bags! I've also heard they've appeared in Canada, but as I'm in California, I can't confirm that. Anyone up for a trade/sale if they can get their hands on them? Hi! I tried quite hard to sell this doll on Tumblr, but naturally it kept falling through. Help me, Monster High Arena, you're my only hope! Selling Jin for $12 + shipping. Comes with keytar. Within the US, shipping will be $5. Ask me for anywhere else. I take Paypal only. I would LOVE to own this doll too, but as someone else pointed out, they would have to pay the real Emily-Ann royalties to use her image. You know how Giselle from Enchanted never became a canon Disney princess? Same reason - Disney didn't want to pay Amy Adams royalties to use her face. I bet a talented OOAK artist could make her out of 13 Wishes Lagoona though! And some Sculpy for the tail. I'm really looking forward to this! I missed out on Ghoul Spirit, so I'm thinking about picking it up for 360. (I don't have any of the other systems.) Don't know if I can justify $40 right away though. I'll have to pick it up when Target has a sale or something. What I wouldn't give for a PC version! Fyi guys, most McDonalds will let you purchase the toys alone for a $1 each! And they usually have 3 different ones available per week, so always ask to see what they have then. I went there twice in the last week since the promotion started and even though I asked for girls toys both times, they gave me Batman! I mean, I love Batman, but what the heck??? Am I pronouncing "girl" wrong??? Bumping to see if anyone has an answer for us since it just came out! Well, this just peaked my interest in this book! I know Clawdeen's gone on record saying she isn't interested in dating anyone in one of the specials... The one were Lala was trying to set her up, and although Clawdeen professed she was interested in dating but then seemed interested in the vampire boy Draculaura brought along, he never came up again. And I've always wondered why out of all the original 6 ghouls - Frankie, Draculaura, Clawdeen, Cleo, Lagoona and Ghoulia - she was the only one without a love interest, or at least someone who liked her. I've often wondered if they've been "saving" her to be a queer character, or something. No matter what, now I'm super interested. The subtitler just released episodes 4 and 5, so it looks like she'll be doing them all! Ever After High Discussion / Re: Way Too Wonderland! Wow, I like Briar's look A LOT compared to the other girls in the line. 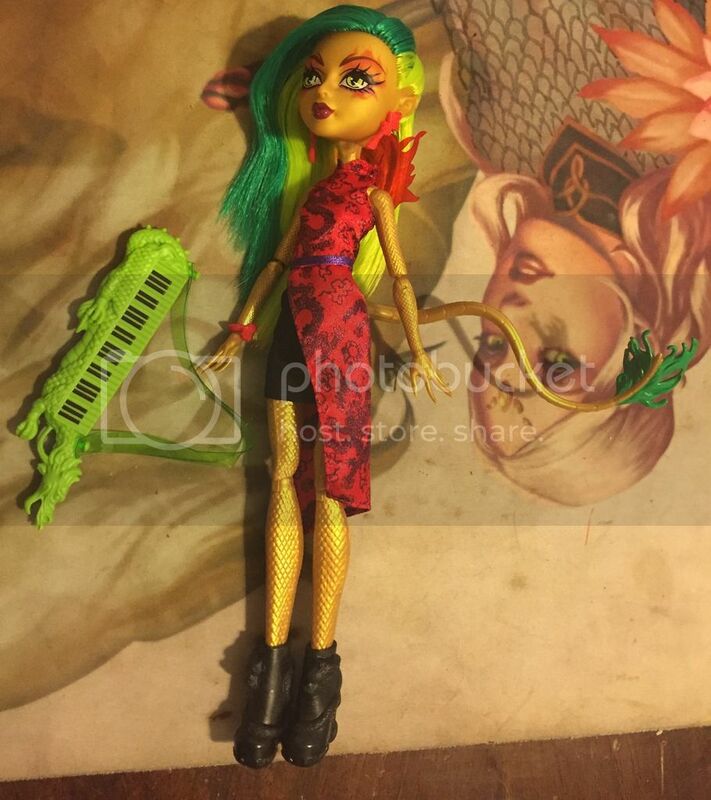 And I bet the outfit would make a great dress for a Venus McFlytrap doll! I thought WtW would be a pass for me, but this Briar is changing my mind! Yaaaay, they've arrived! I think I would prefer mine in-box, thank you! I forget if I've sent you my address or not, so please let me know if you need that, too! Yesss, glad I checked this thread tonight!! Monster Discussion / Re: Would you buy a doll if the seller said it had bad vibes? Haha, this makes me think of the movie Annabelle/the real Annabelle the Doll. Did anyone see the movie? I thought it was dreadful, in the crappy movie kind of way, but it sure was a kick in the pants for me, as a doll collector. I don't think I'd touch something someone said was haunted with a ten foot poll. I've never personally had a supernatural experience of any kind, but let me tell you, I'm not gonna let myself get sucked into dumb-white-people-in-a-horror-movie tropes. So true! If only people were nicer to their possessions, we wouldn't have problems with things like "haunted" dolls, lol! When my sister-in-law was getting married, she rented two beach houses that we all stayed in the night before and after the wedding. They were beautiful houses and clearly owned by some VERY rich people. The room my boyfriend and I were originally supposed to stay in was clearly a child's room, with bunk beds and everything, and we were a little perturbed by the choice they made and asked to be switched to a room where we could share a bed and not constantly be reminded we were the youngest ones at the wedding. Well, we didn't escape the infantilization for long, because right before we went to sleep the first night, we found the following thing living under the sink in the attached bathroom. We put it out in the common area and left it there. The worst part was that my boyfriend had stowed something under the sink before we discovered the doll. The heebie-jeebies that thought gives me is awful. I can see it now, thank you! Still seems to be somewhere in Russia. Off Topic / Re: Steven Universe fan thread! Considering how rival network Nick treats any franchise that isn't Spongebob I don't have much high hopes for CN fostering kinder feelings towards SU when they could be ciphering funds to milk the AT cash cow for all it's worth. This is the company that cancelled Justice League, Green Lantern TAS and Tower Prep because they don't want a female audience "because girls don't buy [boys] toys". It's a heartbreaking situation [Warning, language - even if some is censored]. Especially since, as I have seen, SU is a rather femme oriented/popular show. That interview still haunts me. Girls don't buy boy toys my behind! But anyway. SU's been renewed through what will probably be another year+ of shows (judging by how they spaced out season from later 2013 to early 2015 and then went straight into season 2), so I'm still hopefully. Honestly, I think they're losing money not offering toys. Even if they're only Hot Topic or online releases, plushes and figures will totally sell better than those overpriced phone cases on their web site! Yay, I'm so excited! Thank you again! I can't figure out where to see the map on that tracking page though, haha. Can anyone point me to it? FUNKO POPS FOR THE WIN. But seriously, if they did those, I would buy them all. I have maybe three, mostly usually shaped ones, but Steven Universe versions? Yes please! Imagine the sheer width of Garnet's hair. I'm wondering if the comics were cancelled, maybe it was because of the graphic novel? Like, the comics I've read (and I've found them VERY hard to find as well) were little shorts and vignettes, nothing really tied to canon. Perhaps they decided a full-length, canon-tied graphic novel would sell better? Also! They're releasing an iOS and Android game this Thursday called "Steven Universe: Attack the Light"! I hear you get to play as all the gems!! Soooo looking forward to that book! I'm sad it won't be out until October, but I bet it contains plenty of things that would be considered spoilers today. Also, toys when??? There are some shirts and phone cases (so expensive!) up on Cartoon Network's store, but I need plush Stevens and little action figures!! Possibly of everyone in Beach City. Or an entire Beach City playset. I just need more merch!! Ever After High Discussion / Re: EAH Sightings Thread: for all countries and all finds! Oh, we're in the same area!! Can I ask which Target you saw them at? I'm going doll hunting next week and I may need to change my plans! It was the Toys R Us on Monterey Hwy in San Jose. Good luck with the hunt! Oh hey, you're in my area, RenegadeAngel! I was down at that TRU when the Toy Fair was in town a couple of weeks back. My roommate and I waffeled over buying Kitty that day. We didn't see Duchess. The Target here in Sunnyvale has a bunch of rerelease Cedar. I was also able to get Kitty there, but she was an online return; she was $10 :0 Also, check Ross. My Ross had a bunch of dolls when I went in on Friday. I found Sig Dexter finally, as well as Hattastic Cedar. Wow, I clearly need to go doll hunting in the South Bay! Up here has been abysmal for wave four, even the rereleases. All I've seen are the Hat-Tastic rereleases, and as people have been complaining, the originals are still on the shelves!